Cheers! 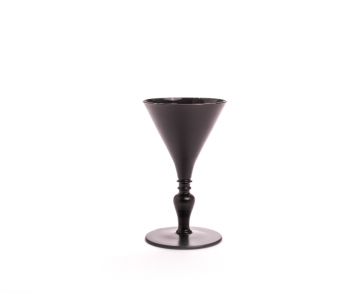 With this beautiful matte black wine glass or cocktail glass by Dutch design brand Droog, any party will be elegant and lively. This glass is 17.7 cm tall and has a diameter of 10.7 cm. It holds 25cl. It makes a great ice-breaker too. The designs of this series of AA wine glasses are based off historical examples from the Rijksmuseum's collection. Interestingly enough, these glasses were designed by an artist collective called Anonymous Artists (AA). AA is widely known as the acronym for Alcoholics Anonymous, an organisation aimed at recovering alcoholics. The glasses are made of modern matte black crystal, though they are also available in classic clear crystal. The AA series of wine glasses by Dutch brand Droog Design consists of different glasses for different applications. That way you can set a table completely, neatly, and - most importantly - stylishly! 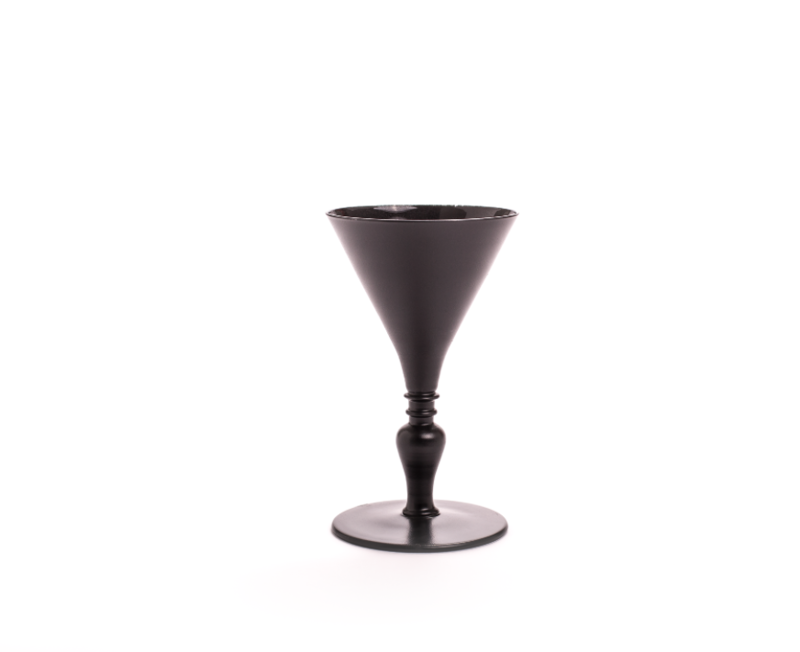 This black wine glass 304.02 has a capacity of 25 cl, 10.7 cm Ø and a height of 17.7 cm. This wine glass is part of a glass tableware set of 4 different wine glasses and a Champagne Flûte. According to etiquette, sparkling wine (wine with bubbles) is used for a toast. Preferably real champagne. For example, champagne from the French Champagne region. Sparkling wines are to be served in glasses with high chalices, also known as flûtes. This way the bubbles will sparkle for as long as possible. For example, take the flute 304.05. Ensure that every plate has a glass for (sparkling or flat mineral) water and that this glass is consistently refilled throughout the dinner. So guests can neutralise their palates regularly. Water is to be poured in a low glass, for example in wineglasses 304.01. Depending on the menu, different wines are to be selected. Rosé or white wine with many light fish dishes. Pour white wine in a glass with a smaller chalice, that way the flavour will stay for longer. Wineglass 304.02 is fitting for this. Larger chalices are acceptable for red wines. The more character a red wine has, the bigger the chalice may be. This is important to allow the aromas to "breathe" freely. For example wineglasses 304.03 or 304.04.